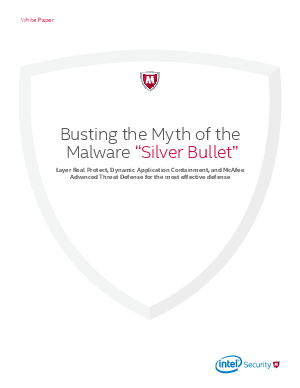 When it comes to fighting modern malware, there is no “silver bullet” that can guard against every threat every time. That’s why Intel Security takes a different approach. We combine multiple layers of advanced malware protection, detection, and correction technologies into a single endpoint defense fabric. To keep up with cyberthreat innovation, effective detection and analysis requires new state-of-the-art anti-malware technologies: Real Protect and Dynamic Application Containment, complemented by the McAfee® Advanced Threat Defense sandbox. Find out how these tools work together to systematically protect against the most dangerous malware threats.